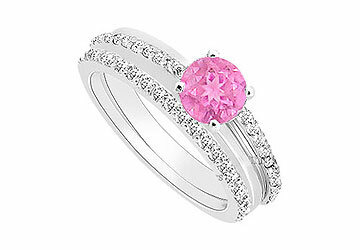 ›Created Pink Sapphire and Cubic Zirconia Engagement Ring with Wedding Band Set 14K White Gold 0. Created Pink Sapphire and Cubic Zirconia Engagement Ring with Wedding Band Set 14K White Gold 0. These stunning engagement ring and wedding band sets with center a bigger brilliant-cut created pink sapphire in prong-setting. Other smaller round CZ make two rows on the sides of the center stone along with matching wedding band. Made in polished 14K white gold and total cubic zirconia weight (TGW) of engagement ring 0.50 carat and wedding band 0.25 carat. • Available Ring Sizes: 4.0| 4.5| 5.0| 5.5| 6.0| 6.5| 7.0| 7.5| 8.0| 8.5| 9.0| 9.5| 10.0| and No Extra Charge for Ring Size. If you need help selecting a ring size, please use our handy Ring Sizing Guide. Simply print it and measure your ring size.